Dr. Mary O’Shaughnessy is a full time permanent lecturer with the Department of Food Business and Development at UCC, Ireland. Her research interests include rural development and the social economy. She is a qualified teacher, holds an MSc in Rural Development and was awarded a PhD on the topic of Survival Strategies and Rural Based Social Enterprise from the NUI. Dr. O’ Shaughnessy sits on the advisory board of the National Rural Network (www.nrn.ie), and is a member of a National Working/Policy Advisory committee on Future Farm Diversification Policy (post-2013). She was re-appointed for a second term to the board of the EMES University Based International Research Network on social enterprises (www.emes.net) in 2015 and was appointed a director of Micro Finance Ireland in September 2015. She is an academic board member of the NUI BSc Rural Development by Distance Learning since 1996 and a committee member of the Annual Irish Rural Studies Symposium. 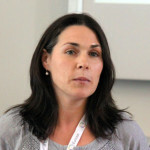 She was appointed in 2017 to the steering committee of a recently launched ITN PhD Training Network: MSCA-ITN-2016 RURAction and is a UCC representative of the H2020 DAFM – Rural Renaissance Advisory group. Her research portfolio includes: peer reviewed journal articles, book chapters, monographs, published conference proceedings as well as working papers and commissioned National and EU policy evaluations/reports. She has reviewed articles for international journals such as Social Enterprise, Public Management Review and Voluntary Sector Review. She is actively involved in both national and international multidisciplinary research networks. She has completed commissioned research projects on behalf of the Irish League of Credit Unions, Irish NGOs, the Irish Government and the EU Commission. Her paper (co-authored with Professor Patricia O’ Hara, NUI Maynooth) was published as part of the EMES Conference Selected Papers series (ECSP), Helsinki 2015. 'Taking the Leap and Sustaining the Journey: Diversification on the Irish family farm' Moroney, A., O’ Reilly, S., and O’ Shaughnessy, M. (2016).